The Red Sea coast offers a view of Egypt that's totally different from its ancient pyramids or the frenetic streets of Cairo. Located 60 miles / 95 kilometers north of the famous resort town of Sharm el-Sheikh, Dahab was once a sleepy Bedouin fishing village. Today, it’s a laid-back, bohemian beach town popular with backpackers and renowned as one of the best dive destinations in Africa. Although scuba diving is undoubtedly Dahab’s premier claim to fame, there are plenty of other activities on offer in and around this Sinai Peninsula jewel. Many of them are inspired by the proximity of the Sinai Desert. 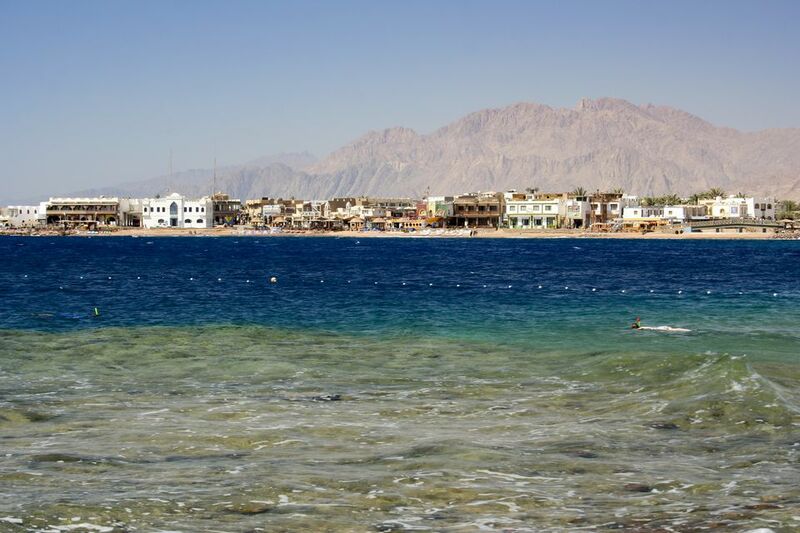 If you haven’t yet discovered the wonders of the underwater world, Dahab is a great place to do so. There are more than 40 dive centers to choose from, and the warm, clear conditions are perfectly suited to beginners. Those on a budget will also appreciate that Egypt’s Red Sea coast is one of the cheapest places in the world to get scuba certified. Entry level Open Water courses take three to four days to complete, after which you’re free to sign up for fun dives to prime Dahab dive sites like the Bells, the Canyon and offshore reef Gabr el Bint. A submarine sinkhole that plunges to depths of over 330 feet / 100 meters, Dahab’s Blue Hole is not the region’s prettiest dive site; but it is certainly its most well known. It’s especially popular with tec divers and advanced freedivers, as its astonishing depths provide an opportunity to test their skills to the limit. The Arch (a 26-meter-long tunnel that leads from the Blue Hole to the open ocean) is considered the ultimate freediving challenge. Many divers have lost their lives at this infamous site, which is known locally as the Diver’s Cemetery. Recreational divers should stick to the shallows. Most Dahab dive centers offer day trips to the SS Thistlegorm, one of the world’s most iconic shipwrecks. Drafted into military service during World War II, the British freighter sank in 1941 after being hit by two German bombers. She was loaded with Allied supplies at the time, including cases of ammunition, armored vehicles, military motorcycles, guns, and aircraft parts. The SS Thistlegorm was rediscovered by Jacques Cousteau in 1955 and is now the jewel of the Red Sea diving scene. Measuring over 400 feet/ 120 meters in length, she lies in relatively shallow water with her wartime cargo still clearly visible. With an average of 300 windy days per year, Dahab is also a haven for kitesurfers and windsurfers. Two sheltered lagoons offer safe stretches of flat water ideal for those learning either sport for the first time, while top spots like Baby Bay provide the perfect conditions for freestyle surfers. Beyond Napoleon Reef, the open ocean creates swells of up to three meters for advanced riders looking for more of a challenge. During the peak summer months, the wind blows almost constantly and the water is balmy. Several shops in Dahab offer kite and windsurfing courses in addition to equipment rental. Ras Abu Galum Protectorate is a natural paradise and Bedouin camp located just north of the Blue Hole. It is possible to hike there, take a boat or join a camel safari. Either way, the protectorate is defined by its breathtaking scenery, with plunging granite mountains meeting the Gulf of Aqaba in a dazzling contrast of ochre and blue. Flora and fauna include 167 species of rare desert plants, and resident animals such as the Nubian ibex, the striped hyena, and the red fox. Snorkeling and diving are popular activities, as are overnight stays beneath the stars at the remote Bedouin camp. Those that want to take a ride on one of Dahab’s stately “ships of the desert” can opt for a two-hour sunset trip to the Blue Lagoon, or to the Wadi el Bida oasis with its elevated views of the town. Half-day safaris head deeper into the Sinai Desert to the oases of Wadi Qunai, Wadi Connection or Wadi Tiwelt; while full-day excursions explore the region’s spectacular canyons. Ain Khudra is a particularly worthwhile destination thanks to its Rock of Inscriptions, where ancient Nabatean, Greek, and Roman pilgrims left their mark on their travels from Jordan to Mount Sinai. If traveling by camel doesn’t appeal, consider a horseback safari instead. Several companies offer the opportunity to gallop along the beach, or to ride through magnificent desert canyons to an oasis where a traditional Bedouin tea awaits. Those that want a deeper insight into Bedouin culture should sign up for an overnight stay at a Bedouin camp with dinner and breakfast included. Other horse-riding tours range from trips to the Blue Lagoon (where you and your horse can go swimming), to horseback snorkeling tours. On the latter, you’ll ride along the beach to the Caves, one of Dahab’s best-snorkeling sites. Spirituality is big in Dahab, with many hotels offering classes in yoga, qi gong, and meditation. Several yoga classes are aimed especially at freedivers, incorporating Pranayama breathing techniques to help students increase their breath-hold time and achieve mental balance underwater. If you’re looking for a more immersive yoga experience, keep an eye out for full moon retreats to the nearby wadis, where the silence and serenity of the desert help to inspire your inner wellbeing. Multi-day retreats also exist, combining beachfront yoga classes with open-air sessions amidst the dunes and canyons of the Sinai Desert. After an early morning dive, head to Ralph’s German Bakery, a Dahab institution since 2009. There are two stores - one in Assalah Square and one near Lighthouse Reef. Both specialize in German filter coffee and mouthwatering pastries made according to the master baker’s traditional Bavarian recipes. You can also enjoy breakfasts and light lunches (think salads, sandwiches, and omelets), or pick up freshly baked bread for a beach picnic or trip to Ras Abu Galum. Above all, both bakeries are a great place to meet other travelers, to surf the free WiFi or relax with a novel from the book-swap library. Bohemian-themed Yalla Bar is another local favorite, located directly on the waterfront and open from 7:00 a.m. until late seven days a week. Boasting a friendly atmosphere, good food, and affordable prices, the restaurant serves European and Egyptian dishes prepared using local ingredients. Sample fresh seafood, or tuck into a tasty pizza. Colorful sun loungers overlook the water and provide the perfect spot for a lazy afternoon of swimming and sunbathing, while Happy Hour sees travelers from all over town congregate to share shisha pipes or sip a cold beer. The bar also offers a comprehensive cocktail menu and free WiFi. Feel like a change of scene? Book a day trip to St. Catherine’s Monastery. Nestled at the foot of Mount Sinai, it is one of the world’s oldest working monasteries and an important pilgrimage site. It was built in the 5th century during the rule of the Byzantine Emperor Justinian, in the place where Moses was said to have heard God speaking to him from the burning bush. Today, an endemic bramble growing at the monastery is thought to be a direct descendant from that bush, while the Sacred Sacristy museum contains a world-famous collection of religious icons, art, and manuscripts. Most Mount Sinai hikes begin at night, putting you at the summit in time to watch the sun rise over the Sinai peaks and the distant Gulf of Aqaba. The mountain stands 7,497 feet / 2,285 meters tall, making the climb a significant physical achievement. It’s also a spiritual experience, as you’ll be following in the footsteps of countless Christian, Jewish and Muslim pilgrims all drawn to the place where Moses received the Ten Commandments. There are two routes up Mount Sinai; the more forgiving Camel Trail, or the Steps of Repentance, an arduous set of 3,750 steps carved during the 6th century.